However, after electrospark machining the material surface and hole interior are left with countless scratches not visible to the naked eye. Daiwa’s proprietary technology eliminates all your worries! Our products provide a completely clean finish. World's Smallest Diameter - 2µΦ!! We also can provide a double-guard finish via osmium plasma ion coating! With overseas products, the board surface is cleaned smoothly to a certain extent but burrs and imperfections in the hole are clearly visible. 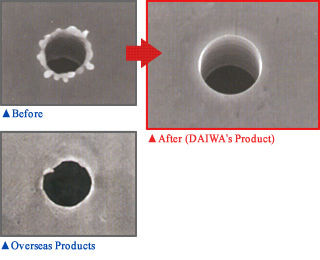 However, with Daiwa Techno technology, both the surface and the hole opening are completely clean. Looking at the board from a 40° angle, we see that with the overseas product, countless scratches are visible on both the surface and on the interior of the hole. Using our product, both the surface and the hole opening have a clean finish. See the smooth finish of the tapered surface (spotface surface)! Our finishing process cleans not only the surface but also the tapered surface; the reverse side of the hole.